SearchReSearch: Answer: Gipsy Kings questions--What language and what's that musical practice? 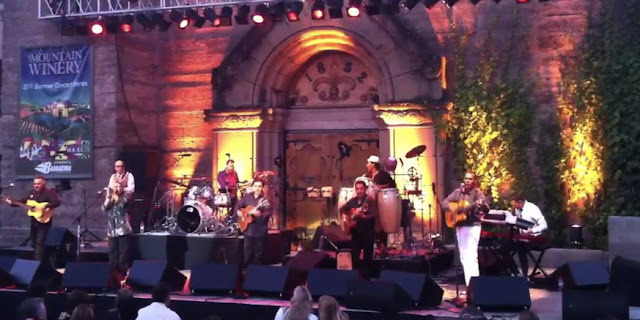 Answer: Gipsy Kings questions--What language and what's that musical practice? ... taking up most of my cognitive capacity. That's why I can't listen to music as I work--my brain can't NOT pay close attention. When I went to see the Gipsy Kings in a concert I was enchanted and fully engaged--although that didn't stop me from taking note of a few items that sparked my curiosity. As I assume you do, I always have a piece of paper and a pen to jot down these questions that I don't want to answer then and there, but things to look-up when I get home. O - L/U what language is Wil Wajiwi ? At least that's what I wrote down during the concert. It's a great way to remember all of those things you'd like to learn, but can't seem to remember when you get home. 1. What language IS this lyric (Wil Majiwi...)? That is, I double-quoted it so Google wouldn't try to spell-correct it or give any synonyms. This trick is an important one to use when searching for unusual spellings or words in languages you don't know. while some have last word as "wilnana." This gave me a bunch of results, many of which I opened as separate tabs ("lateral browsing"), opening 4 or 5 results at a time to quickly scan between them. I found one clue that "Majiwi" refers to an Australian Aboriginal tribe (as noted in the book An Ethnography of Stress: The Social Determinants of Health in Aboriginal Australia but that's probably not what I was seeking. While I got a lot of results, none of them really answered my question. What to do next? I also tried to find an online language identification tool [ language identification tool ], but that didn't work out. The only one I could find online (LangScape) identified this text as Kekchi, an indigenous Mayan language of Belize. Could be; but I bet not. I don't think the Gipsy Kings have any Mayan in their background, nor have they visited Belize. 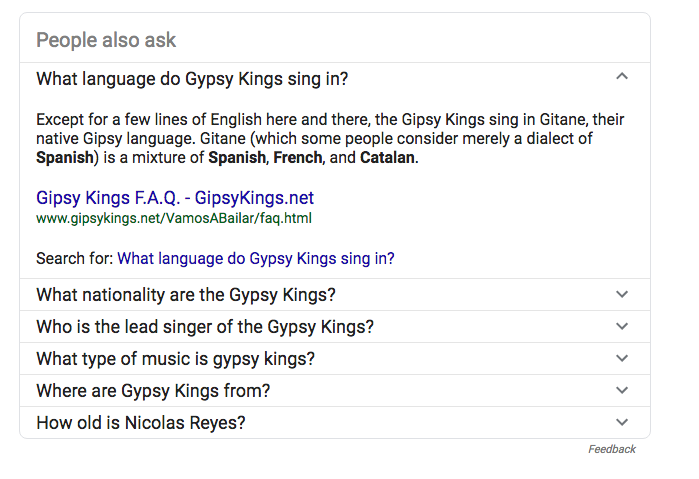 Clicking on the FAQ link takes you to the GipsyKings.net site where they say the Kings sing in Gitane, a combination of Spanish, French, and Catalan. That would seem to answer the question. But Luís Miguel's comment made me think that maybe there's something else going on here. that gave me 27 hits--not too many. I started checking them out and found this intriguing comment in one of the forums: "And all bets are off when they're singing in what I assume to be Caló..."
What's Caló? A quick check on Wikipedia tells me that it's is a language spoken by the Spanish and Portuguese Romani. It is a mixed language based on Romance grammar, often used as an argot, a secret language for discreet communication amongst Iberian Romani. Again, from the GipsyKings.net site--a link to a Vancouver Sun newspaper article that tells us "The Kings speak and sing in the French Provencal and northern Spanish Catalan dialects in addition to the gypsies' own Romany language..."
So... we don't have definitive proof, but it's clearly NOT Spanish or Portugese, but is most likely to be Gitane, Caló, or Romany...or some blend of all three. In any case, the words spoken / sung / written in the lyrics are something not in common parlance. There are still some mysteries in the world. 2. As I was sitting in the concert, I was struck by the number of times they would sing in long, beautiful, intricate phrases, spending quite a while varying a single note up and down. It occurred to me that this musical technique MUST have a name. I'd like to know more about this practice, but to search for it, I need to know what to search for--so... what's this called? which gets you to the idea of melisma. A quick YouTube search for [ melisma ] leads to a bunch of nice instructional videos: Kim Chandler's (Voice Council Magazine) instructional video; Mariah Carey's melisma is famous (as is her incredible whistle tone super-high pitched melisma); and a compilation of melismatic passages video. 1. Not everything has a simple answer! It turns out that my simple note to myself ("what language is...") isn't easily answerable. At least not yet! At some point, some journalist might well ask this question, and we'll get the answer from the source. But at the moment... it's still a mystery. 3. A simple description of the thing you seek often works really well. In searching for that singing style, the fastest search is a short description that contains all of the key features (in this case, multiple pitches on a single syllable). The Joy of Finding Out All of the copyedits got turned in on Monday of this week--exactly on schedule. I get one more iteration on copyediting, then on to the full resolution galleys! Forward progress was made! just found it curious to find "wajiwi" turn up in Ojibwe - in MN - related to the Leaf Hills Moraines and an early photo - a very circuitous route to an interesting dead end. "The Leaf Hills Moraines, sometimes called the Leaf Mountains, are a range of hills in west-central Minnesota. The land does not exhibit many characteristics of mountains, but nevertheless rises typically to a height of 100 feet (30 m) to 300 feet (91 m) above the surrounding farmland, occasionally reaching higher than 350 feet (107 m). The name of this range of hills is translated from the Ojibwe Gaaskibag-wajiwan, which was interpreted by Gilfillan as “Rustling Leaf Mountains.” The name is also shared by Leaf Mountain Township, the two Leaf Lakes ("Gaaskibag-wajiwi-zaaga'iganan"), and the Leaf River ("Gaaskibag-wajiwi-ziibi"), all named for the hills. In turn, the hills in Ojibwe are named after Inspiration Peak ("Gaaskibag-wajiw"), the highest hill of this hill range." photo - "First published in 1895 by the US Geological Survey "
Which I think could with a little polishing mean something like : I will go out, Maggie will go out, Will we go out together? Any Arabic speakers out there with an opinion?